These reusable sandwich wraps are designed to mimic the vivid colors found in the natural world, reminding us that nature isn’t boring. DURANGO, COLORADO, USA, October 30, 2018 /EINPresswire.com/ — Designer Sarah Thompson from Earthen Tribe has released her brand new signature line, The Kaleidoscope Collection. Each product will be individually made by the designer herself. 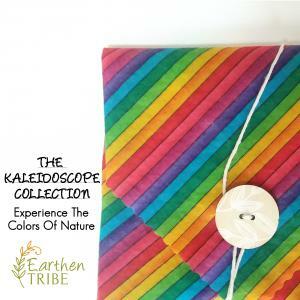 Earthen Tribe is known for helping environmentally conscious families save the planet with style. Thus, for the first time, Sarah has created an entire product line of her favorite and most vibrant beeswax sandwich wraps. The new Kaleidoscope Collection was released live on October 16th, 2018. The collection is being exclusively sold on the website https://www.etsy.com/shop/Earthentribe where the limited products are scheduled to sell out by the end of the season. The reusable wraps are designed to showcase the fun side of being sustainable with non boring colors and prints that make earth conscious moms feel as though they were an eco-fabulous superstar. Several products come in popular designs to capitalize on today’s trends. All wraps are made from organic beeswax which is antibacterial and water resistant. This means moms will be able to keep their little one’s food naturally safe and fresh. Sarah is excited to welcome her fans to the new handmade product line collection they’ve been requesting. Sarah Thompson started designing reusable snack and sandwich bags after she was faced with a very real problem. She hated wasting money and resources on disposable baggies to hold snacks for her toddler. After many years of creating reusable snack and sandwich bags by hand, and selling in a local children's boutique, Sarah’s products started gaining notoriety amongst the eco conscious industry.